The dystopian novel is one of the most popular subgenres in YA literature. I recently had the opportunity to read the novel "Revealing Eden" written by author Victoria Foyt. This book was an unexpected surprise, given the variety of issues that emerge during the reading. Eden is a pearl in a world where the coals are the ruling class. Pearl and Coal are racial epithets used by people in this society. She lives in a society where human beings are valued according to their phenotype and how pigmentation makes them fit to survive the environmental conditions. In this society where Eden lives, each individual seeks a mate to ensure the survival of the species. When people are knowing each other, before asking questions like what is your favorite music? or What colors you like? they prefer to know their genetic analysis and if they possess features that could improve an offspring. Eden is a pearl, a person with caucasian pigmentation. A caucassian can hardly survive the onslaught of the sun on their skin and the temperatures. The pearls are kept sheltered in a facility without receiving contact with sunlight. For their 18 birthday they must have a partner chosen to procreate and continue the species, so they can continue receiving those things that need to continue living. Eden is close to its 18 years, and although she is brilliant, his genetic analysis gives her only 15% of aptitude as a mate. She is yet to found a partner that complements her. She has only received interest from a young coal who works in charge of security at the site where Eden and his father, a scientist, works. Blinded by this opportunity and desire to find a mate, Eden reveals her father’s work without even realizing it, detonating a drastic change in their lives. 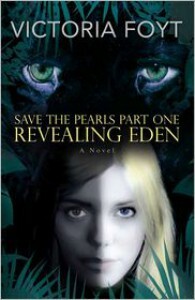 Eden was forced to leave her life behind and start learning to survive in another environment and other circumstances. Her life is going to be impacted by a quasi-supernatural and fantastic creature, born of a genius scientist, who will redefine her preconceptions about herself, about her feelings and about about what is beauty. The cover of this book is interesting and intriguing, gives a clue to the theme of the story, but never gives it away. The image in front is striking and captures the reader's interest. The plot developed in this post-apocalyptic totalitarian society book is characterized by interesting plot twists, and the discussion of a variety of issues. A caste society- individuals are classified into groups according to their value in society. This value is assigned according to the pigmentation of the person and how fit they are in order to survive. These groups are named based on racial slang. Racial equality - society is governed by rules that seek to maintain order subjecting the less fit for survival in obedience by developing low self-esteem in people. Ethics in science: Genetic manipulation - To what extent might be acceptable or even necessary genetic manipulation? Or is it unacceptable? Resource conservation- conservation of resources to provide adequately for a population of individuals who prove to be useful in that society. The utility in this case lies in reproductive potential to produce individuals capable of surviving. Environmental impact- damage to the environment /atmosphere caused social change. The world where these characters interact is one that clearly shows a racial divide. The beads have lived for generations indoctrinated to think that they are less than the ruling class, the coals. For much part of the book, Eden sees herself as ugly and worthless. Only when she abandons society, she begins to know herself and show others her genuine self. What do I think about Eden? Eden initially underestimates herself. She is brilliant, but in turn, completely naive. Only wanting to find a partner to survive and not be released outside and die because of the temperature. True her ordeals she finds herself. Source: Received from Bookmasters and Sand Dollar Press Inc. via NetGalley in exchange for a honest review.